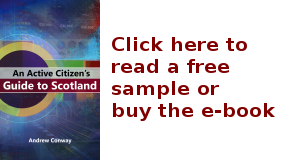 A book that shares an understanding of the information and data describing Scotland's society and economy. I mostly avoided party politics in writing the book (which is distinct from avoiding political issues), but here's my brief take on the numbers from yesterday's Scottish Parliament elections. The table below shows the main results from the 2016 Scottish Parliament elections. The numbers of voters, votes and seats are taken from the BBC website and all other figures are calculated from them. The % of votes is the number of constituency plus regional votes for each party divided by the combined total of all constituency plus regional votes. I'll not go through much of the more obvious commentary you can read on most news sites, but here are a few more nuanced points I've noticed from looking at the numbers. The Conservatives clearly did very well, and their tally of 31 seats exceeds the combined total of the only two left wing parties to win seats: Labour with 24 and the Greens with 6. The PR (Proportional Representation) system, does what it says on the tin, and makes sure the number of seats is proportional to the distributions of votes cast. Compare these results with the FPTP (First Past The Post) system used in UK General Elections which saw 50% of the vote get the SNP 95% of Scotland's MPs. The Scottish PR system is not perfect though. The SNP got 44.1% of votes cast but 48.8% of seats. The Conservatives got 22.5% of votes and 24.0% of the seats. The Greens also did well out of it, getting 3.6% of the votes but 4.7% of the seats. The other parties lost out in comparison: Labour got 20.8% of votes but only 18.6% of the seats, and the Liberal Democrats got 6.5% of votes but only 3.9%. UKIP may feel the most aggrieved though as they got 2% of the regional vote (they had no constituency candidates) but zero seats. Pro-independence parties (SNP, Green, Solidarity, RISE) took 48.2% of the vote and pro-union parties (Conservative, Labour, Liberal Democrats, UKIP, Scottish Christian Party) took 51.1% of the vote. The remaining 0.7% was for smaller parties and I'm not clear on where some of them stand on independence, or indeed if they have a position at all. If we split parties by their proposals on tax, then 31.5% of votes went to parties that explicitly proposed raising rates of income tax (Labour, Greens, Liberal Democrats, Solidarity and RISE), whereas 67.6% went to parties who proposed much more modest changes to taxation (SNP, Conservatives, UKIP). This is in the context of this Scottish Parliament having more tax raising powers than any before it. The same party groupings apply to the issue of fracking: 31.5% of votes went to parties that ruled out fracking, and 67.6% went to those which didn't. Of course, there's much more obvious internal party division on this issue than for tax. The 2016 turnout is about 5 percentage points up on 2011's 50.4%, but nothing like the 85% of the 2014 referendum, or even the 71% of the 2015 General Election in Scotland, or the 66% UK-wide turnout. There were slightly more votes cast in the regional vote than for the constituencies. Finally, notice the % of electorate row. Scotland's new minority SNP Government will be formed with the explicit consent of 24.6% of the electorate. Ironically, this is slightly up on the 23% that got them a majority government in 2011, and similar to the 24.3% that the Conservatives got for their current UK government. Now, I'm not saying there's anything unfair about this. If people do not vote, then we should not infer anything about whether they approve or disapprove of who forms the government. In fact, there's a reasonable argument that they've got no right to complain about it. But, I do feel it's important to consider the questions raised by poor voter engagement, and doing so formed part of the motivation for writing my book. Although I have mused on it recently, I don't have any good answers. But I suspect they will come if awareness of the issue is raised to the point where people start to discuss it more openly. I am, however, reasonably certain of who will not come up with a solution: governments. What incentive is there for elected politicians to deal with the very large percentage of the population that don't vote? Of all the graphics I've produced for the book and for blogs, the diagram you see below received the most attention, being much re-tweeted on twitter and shared on other social media. For this reason, and to help me get my head around Scotland's complex fiscal flows, I've now produced an interactive version. This diagram, from Chapter 5 of the book, gives a high level summary of Scotland's fiscal flows over its three levels of government. 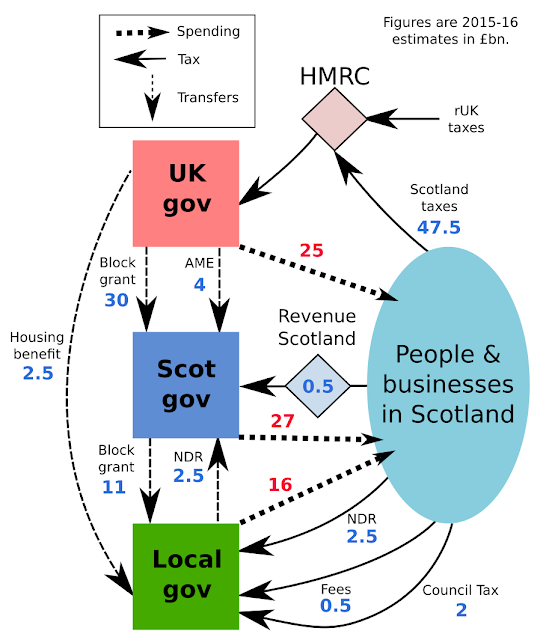 Frankly, the diagram is rather involved and off-putting if you're not already acquainted with Scotland's fiscal intricacies. So I've produced this interactive version which is simplified in appearance but still captures all the main flows. Have a play with the sliders then click the Help tab at the top and read the Quick Start bit, and, if you wish, read the rest of Help page for gorey detail and a full list of sources. In addition to the numbers shown on the diagram, the simulation calculates deficits for each level of government (spending less tax) and estimates of the extra interest payments they would add in future years. Here's a brief FAQ to help demystify some parts of it. Why does the UK government get £47.5 billion or 90% of Scotland's taxes? This is collected by HMRC on behalf of the UK and Scottish governments. Although £47.5 of Scottish taxes does go into the UK government, the total coming back to Scotland is £25+30+4+2.5=£61.5 billion. But does the UK government control 90% of Scotland's taxes? No. For 2015-16, the Scottish Government controlled (as in was able to set tax rates for) about 17% of tax. Once the Scotland Act 2016 (Smith) powers come into force in the next few years, this will rise to 40%, included assigned VAT. Just over 60% of all spending in Scotland is controlled by the Scottish and Local governments, and the NHS and education are completely devolved. The UK's spending in Scotland is almost entirely on pensions, benefits and defence. See this post for more detail. Total spending in Scotland is £68 billion but total tax raised is £53 billion. What makes up the difference? The £15 billion difference is Scotland's notional deficit. The only major government publication where you will find this number is the GERS report (in which it is referred to as the Net Fiscal Balance including a geographical North Sea share). It is not in the Scottish budget, nor Scotland's nor the UK's national accounts. The £15 billion is part of the UK's total deficit and so is covered by UK government borrowing. If Scotland had become independent in March 2016 as a result of a Yes vote carrying in the 2014 referendum, then such a deficit would have to be covered by Scottish Government borrowing, tax rises or spending cuts. Non-Domestic Rates. These are business rates that are collected from businesses in each council region, then given to the Scottish Government which then redistributes them back to the councils (included in the £11 billion block grant figure). The redistribution to individual councils is of course not visible on this high level diagram. Annual Managed Expenditure. This is money that the government(s) must pay out but that cannot be planned for in advanced and so is handled on an annual basis. The most well known fiscal transfer from the UK government is the block grant calculated according to the Barnett formula, but there are others, with the two largest being shown on the above diagram. £4 billion of AME goes to the Scottish government for welfare payments, such as pensions, and the UK's Department of Work and Pensions (DWP) transfers about £2.5 billion to councils to pay housing benefit. Where do all those figures on the diagram come from? They are all based on reports published by the Scottish Government in the last year or so. Go to the simulation and click on the Help tab at the top left and scroll to the bottom for a full list of references. If you've got better figures, feel free to alter the default values I've put into the simulation. Why should I read this book? I go by the name mcnalu online, but my real name is Andrew Conway and I am interested in computers, science, economics, writing and er, well, um, humans I suppose. My personal blog is blog.mcnalu.net.